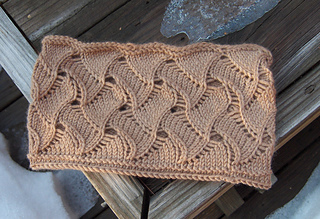 This cowl is knit in a round using lace pattern all the way through. Depending on the softness of the yarn it might benefit from lining to prevent rolling. 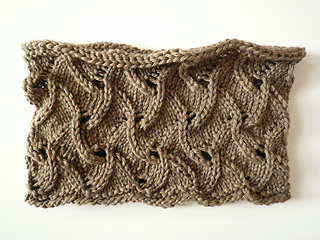 Adventurous beginner – simple lace, knitting in the round, simple finishing. Circumference 18 ¾ (21)” / 48 (53.25) cm and 5 ½“ / 14 cm high. One 50g ball of Aran weight yarn for a lace shell and another 50g ball for lining. Shown in Cashsoft Aran (57% extra fine merino / 33% microfibre / 10% cashmere) by RYC 87m (95yds)/50g ball. 19 sts and 25 rnds = 4” / 10 cm in Stocking stitch knit in the round. Size 4.5mm (US7) circular needle. Adjust needle size to get the correct gauge if necessary.